In recent years, social media has become ubiquitous and most important for social networking, content sharing and online accessing. Due to its reliability, consistency and instantaneous features, social media opens a wide place for businesses such as online marketing. Marketing which occurs via social media is known as social media marketing. Social media marketing has made possible for companies to reach targeted consumers easily, effectively and instantly. Besides that, social media marketing also faces several challenges in the field. Social media marketing is a new trend and rapidly growing way in which businesses are reaching out to targeted customers easily. Social media marketing can be simply defined as the use of social media channels to promote a company and its products. This kind of marketing can be thought of as a subset of online marketing activities that complete traditional Web-based promotion strategies, such as e-mail newsletters and online advertising campaigns (Barefoot & Szabo 2010). By encouraging users to spread messages to personal contacts, social media marketing has injected a new term of exponential dissemination and trust to mass-communication and mass marketing (Hafele, 2011). By this new approach of outreach and marketing, new tools are being developed and increased in turn for businesses. Social media marketers are now going better and more effective insight through the introduction of analytic applications by official social network site platforms (Hafele, 2011). – Social media can give the opportunity to collaborate with stakeholders. – Social media can involve potential attendees in the organization process. – Social media can promote events by creating event listings and videos on social networks. – Social media can support live-stream the event to reach national & global spectators. – Social media can monitor the buzz and use it to collect feedback. FC Barcelona have claimed they have become the first sports club anywhere in the world to be able to boast more than 100 million followers on its social networks. Sporting and social excellence has led to leadership in the 2.0 market, where FCB is the top club on all the world’s major networks. In fact, the club is gaining about 100,000 new followers a day on its different social networks, and is the number one sports club on each of Facebook, Twitter, Instagram, Google+, Tencent Weibo, Line and YouTube, the biggest platforms in the world. 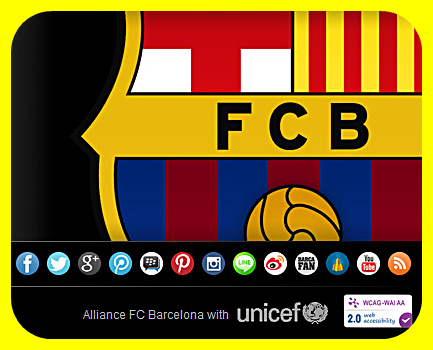 On Facebook, for example, FC Barcelona’s page is one of the 25 most popular in the world. Just a few weeks ago, FCB passed the 50 million mark and is considerably ahead of the likes of Real Madrid, Manchester United and Chelsea. On Facebook, Barça has more followers than any club in the top North American leagues, including the NBA, MLB and NFL, and more than any club in Europe’s top soccer leagues, including the FA Premiership. Out of the Catalans 100 million followers Facebook had a dominance with 64.2% of the total, almost three times more than Twitter (22.3%). The club also has popular accounts on Google+ (7.7%), Tencent Weibo (3.2%), Instagram (1.5%) and YouTube (1.2%). 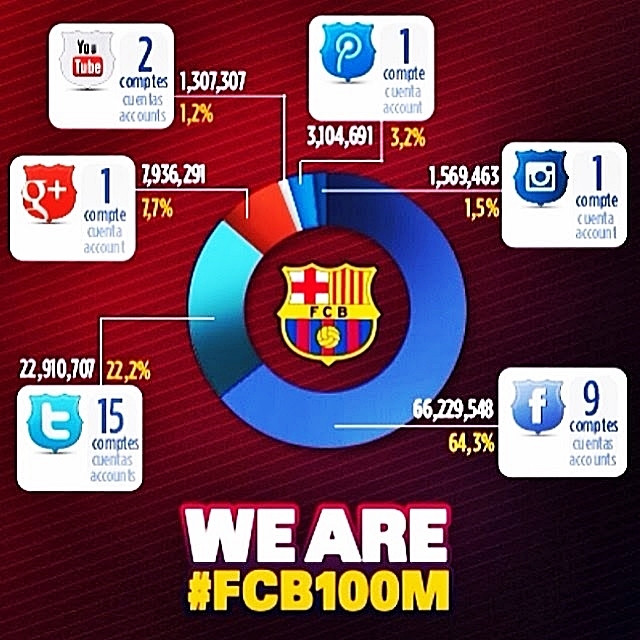 In 2013, there was an increase of 32 million followers on all of the club’s social networks. But more than just setting records in terms of numbers, FC Barcelona is also working hard to ensure that its supporters make the most of these platforms by receiving all the very latest news and information. As well as official social networks, FC Barcelona has a further 17 million users of LINE, the application for I-phones and computers that can be used to connect with 300 million fellow users around the world. FC Barcelona already has official LINE accounts in Catalan, Spanish, English, Portuguese and Japanese. LINE, like social networks, is another wonderful way for being in constant connection with the club and being among the first to receive news updates and be able to access exclusive promotions. For the longest time, policy and guidelines have been an issue to FCB and FCB has been trying to push on this site. But FCB had problem to learn how clubs were educating its employees about the effective social media policy. For Barcelona, their Social Media Policy places an emphasis on responsibility, however, what is clear is that this doesn’t naturally mean restrictions. But their challenge and digital marketing team changed FCB ‘s social media policy and point of view. Finally they can open innovative and most advanced social media marketing around world. – Sporting and social excellence has led to leadership in the 2.0 market, where FCB is the top club on all the world’s major networks. – Social Media Policy for staff and players: FCB just tries to give all the information, tools and support to all FC Barcelona employees, football players included, in order to be aware of. – Investing in long term Social Media: The social team sits naturally within the Marketing and Communications department of the club, but the primary objective for the team is to keep the best relationship with all Barça Fans. There are profitable target audience and sustainable marketing resource in social media network. Nevertheless worldwide sports clubs will have some problem and difficult to find new sponsors and fans outside nations and present market. They have to exploit and develop potential social media marketing in the prosperous market and customers like Asia, Africa, and America. But it is very hard to start business promotion and advertising in these area because of some countries have very strict legal condition for foreign companies. For example in China, main social media like Goggle, Facebook, Twitter, cannot delivery their information to directly to customers and fans. Only China’s Weibo can delivery twitter function and Line from Japan can be used for messenger service. But FCB’s digital marketing policy could connect Weibo/Line directly to the FCB website and new local digital app gave new marketing opportunity in these area. Furthermore these social media network were spread very quickly and efficiently to huge Asia area. Social media network has globalization effect but at the same time, it needs practical localization strategy for effective social media marketing. China and USA can be another two main sport business power and marketing place like that their big 2 economy power. Until 10 years, China and USA football league can grow to world 7 football leagues. As result, Social media network are the core platform of marketing 3.0 and best marketing tool for sports business. Without qualitative & flexible social media policy to sports industry, it is impossible to produce another sports industry revolution for sports clubs. Excellent Website, Preserve the good work. thnx!. I have been exploring for a little for any high quality articles or weblog posts in this kind of area . Exploring in Yahoo I ultimately stumbled upon this site. Studying this information So i am satisfied to express that I have a very excellent uncanny feeling I found out exactly what I needed. I most surely will make sure to do not forget this website and give it a glance on a relentless basis.